Mecklenburg County is the most populous county in the state of North Carolina, although it is in danger of losing that status to faster-growing Wake County. The county seat is Charlotte, the largest city in the state. Nearly 1 million people reside within the county. Once a sleepy southern city, Charlotte is now the second-largest banking capital in the United States. The county boasts an educated workforce and has recently become a city of international renown, while retaining a certain degree of Southern charm. Charlotte was the site of the Democratic National Convention in 2012 and was considered a success by the Obama campaign. For years, the “Charlotte curse” seemed to prevent local politicos from ascending to state office. Being an urban county in a vastly rural state, Charlotte and its politicians was treated with suspicion by North Carolinians across the political spectrum. Political strategist Jack Hawke, who ran Jim Martin’s campaign for governor in 1984, said that the candidate was from the town of “Lake Norman” in order to avoid the Charlotte connection. As North Carolina has become more urban, however, the state is becoming more like Charlotte every day, and the ‘curse’ was broken by former Charlotte Mayor Pat McCrory, now governor of North Carolina. McCrory did particularly well with unaffiliated voters in urban areas of the state. 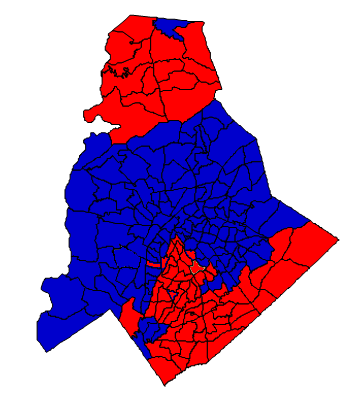 Politically, Charlotte is divided between the city and its suburbs. Until recently, the city has prevailed over the suburbs, but laws passed by the state legislature seeking to curb the power of cities has changed the balance of power. The city is strongly Democratic and has become even more so in recent years due to an influx of black residents from northern states. The suburbs are strongly Republican, but in-migration has had a moderating influence. Republicans in the county tend to be more moderate and concerned with urban interests, such as traffic congestion. Mecklenburg County boasts more power and influence in state politics, and national politics, than ever before in its history. Governor Pat McCrory and Lieutenant Governor Dan Forest are from Charlotte, as is Speaker of the House and probable Senate candidate Thom Tillis. Bob Rucho, a powerful member of the state Senate, represents a district based in the Charlotte suburbs. Charlotte is gaining prominence even on the national level with the appointment of Mayor Anthony Foxx as Secretary of Transportation. In the past, urban counties in North Carolina offered more support for Republicans than their rural counterparts. Now, the reverse is true, and Mecklenburg is one of the strongest Democratic counties in the state and offers a rich source of voters for Democratic candidates. Obama won the state in 2008 thanks to strong support from Mecklenburg voters, and any Democrat who hopes to win statewide needs similarly strong support. Republicans need to do well in the red suburban areas in order to counteract the influence of deep blue Charlotte. Mecklenburg was a major battleground county in the 2012 election. Both Democrats and Republicans heavily targeted the county to get maximum turnout from their base. Forecast: Since 1988, Mecklenburg has consistently trended to the Democratic Party. The biggest change came from 2004 to 2008. The Obama campaign worked to transform the electorate in Mecklenburg, and what was once a toss-up county became solidly Democratic, thanks to registration and record turnout of huge numbers of African American voters and an influx of more moderate voters from the northeast. The growth rate from 2000 to 2010 was 32.23%. Expect a slightly lower growth rate in the 2010s decade. Given its banking economy, Charlotte recovered remarkably quickly from the 2007 recession. Unemployment is still a problem, but Mecklenburg remains a popular place to relocate. This should be bad news for Republicans, because growth in Mecklenburg is highly favorable to Democrats. The county is particularly popular for African American transplants – the black growth rate last decade was 45.90%, but the white growth rate was only 14.31%. Potential problems for the county in the future include overcrowding and white flight. In 2012, Pat McCrory narrowly won Mecklenburg due to his mayoralty in Charlotte. Expect McCrory to be the last Republican with the ability to carry the county. Romney lost here by 23 points, and Elaine Marshall carried the county against Richard Burr despite being blown out statewide in 2010. Democrats have solid control of the County Commission and the Charlotte City Council. Although Mecklenburg is the most populous county, it only has the second-highest number of voters because of lower turnout from minority groups. Mecklenburg is divided between three congressional districts. The 9th district, represented by Robert Pittenger, is strongly Republican and takes in the Charlotte suburbs. The 12th is strongly Democratic and takes in many African Americans within a Charlotte; it is currently represented by Mel Watt and could soon see a change in representation if Watt is successfully confirmed for an appointment at Fannie Mae & Freddie Mac. There is also a small sliver of the 8th district, represented by Richard Hudson, that reaches into some strongly Democratic precincts in Charlotte. In recent years, urban counties like Mecklenburg – across the state and across the nation – have trended to the Democrats. But Republicans have also trended away from the interests of urban voters by focusing on a more rural constituency – a constituency that is diminishing in influence. As these urban areas grow in influence, Republicans might be forced to move to the center. We are not at the point where urban counties effectively control the politics of this state. But we are slowly getting there.